The World Reconstruction Conference is a global forum that provides a platform to collect, assess, and share experiences in disaster recovery and reconstruction and take forward the policy dialogue. The fourth World Reconstruction Conference (WRC4) will be held in Geneva on May 13-14, 2019 under the theme “Inclusion for Resilient Recovery,” building on the recognition and consensus of previous WRCs that recovery can risk reinforcing existing inequalities; that a resilient recovery is imperative to sustainable development and poverty reduction; and that to be resilient, recovery must build back better. WRC4 will be held in conjunction with the 6th Global Platform for Disaster Risk Reduction (GPDRR, May 13-17, 2019). The conference will bring together leaders, experts, policy makers, and practitioners from government, international organizations, NGOs, academia, and the private sector from both developing and developed countries. It will also build on the experience and lessons learned from the previous editions. The WRC4 is expected to bring together experts, practitioners and stakeholders from various institutions and community-based organizations (associations active on gender equality and/or women’s empowerment, disabled people’s organizations, indigenous peoples’ rights, ex-combatants, youth participation, and migrants integration). A common registration web page is set up for the Global Platform for DRR and the World Reconstruction Conference 4. Register now on the Global Platform page. Social inclusion is defined throughout Inclusion Matters as both "the process of improving the terms for individuals and groups to take part in society" and, more specifically, as "the process of improving the ability, opportunity, and dignity of people, disadvantaged on the basis of their identity, to take part in society." Inclusion in disaster recovery and reconstruction is a key condition for the people’s resilience. A more inclusive recovery fosters equal rights and opportunities, dignity and diversity, guaranteeing that nobody from a community is left out because of their age, gender, disability or other factors linked to ethnicity, religion, geography, economic status, political affiliation, health issues, or other life circumstances. The international frameworks set up by the Agenda 2030 for Sustainable Development Goals, the Sendai Framework for Disaster Risk Reduction, the Paris Agreement on Climate change all advocate for an increasing focus on resilience and inclusion. The overall goal of the WRC4 is to build consensus and to renew and accelerate efforts towards realizing inclusive recovery processes. To this end, the conference will discuss the challenges and inherent biases in the process of recovery and the reasons for which certain population groups are systematically excluded. Identifying effective ways to ensure inclusive recovery and reconstruction processes for governments, international organisations, NGOs and civil society groups to create opportunities for active and meaningful participation of the communities in recovery to make this process more inclusive. Building consensus on gender-responsive approaches to promote shared recovery benefits. Due to pre-existing gender inequalities, women are generally hardest hit by a crisis and remain a marginalized group in most societies, even more so when gender-based discrimination intersects with other forms of vulnerability such as physical disability, belonging to minority groups, etc. Enhance inclusion of people with disabilities in recovery and reconstruction. Constraints in accessing natural resources, risk warnings, information on coping and responding, transportation and emergency shelters, in addition to socio-cultural barriers limiting participation and movement, are worsened by disasters and other crises. People with disabilities, who make up 15% of the world population, are disproportionately affected by those impacts, given their specific livelihood circumstances, their socio-political isolation (perpetuated by stigma, discrimination and exclusion), and related information asymmetry and constraint in decision-making processes due to lack of access to these processes and lack of meaningful inclusion. Fostering inclusion in disaster preparedness and response. To be effective and equal, disaster preparedness and response must be participatory and inclusive so to address the needs of all groups. It is, therefore, critical to engage the affected population in determining such needs and priorities. The WRC4 will further contribute to the international discourse on inclusion by raising awareness, facilitating discussion, sharpening the thinking, and setting the agenda for future engagement. This concept note provides information on WRC4, including background, objectives, contribution to international frameworks, information about the theme, and conference agenda. Cette note conceptuelle fournit des informations sur la WRC4, y compris le contexte, les objectifs, la contribution aux cadres internationaux, des informations sur le thème et le programme de la conférence. 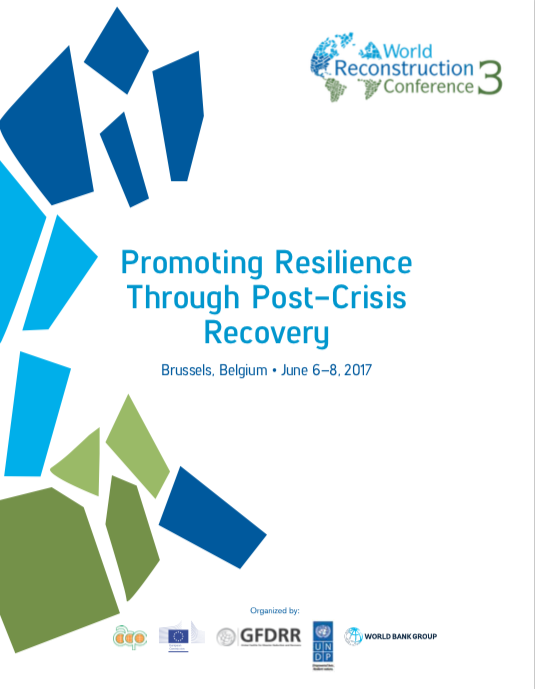 Proceedings from World Reconstruction Conference 3 in Brussels, Belgium, which focused on “building back better in recovery, rehabilitation and reconstruction,” Priority 4 of the Sendai Framework for Disaster Risk Reduction. 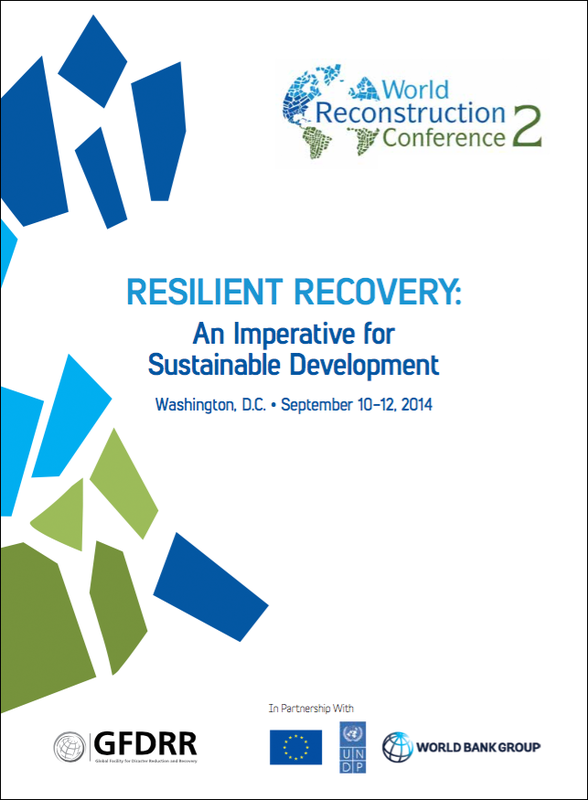 Proceedings from the 2nd World Reconstruction Conference, which took place in Washington, D.C. in 2014. The sessions centered on the theme, "Resilient Recovery: An Imperative for Sustainable Development." 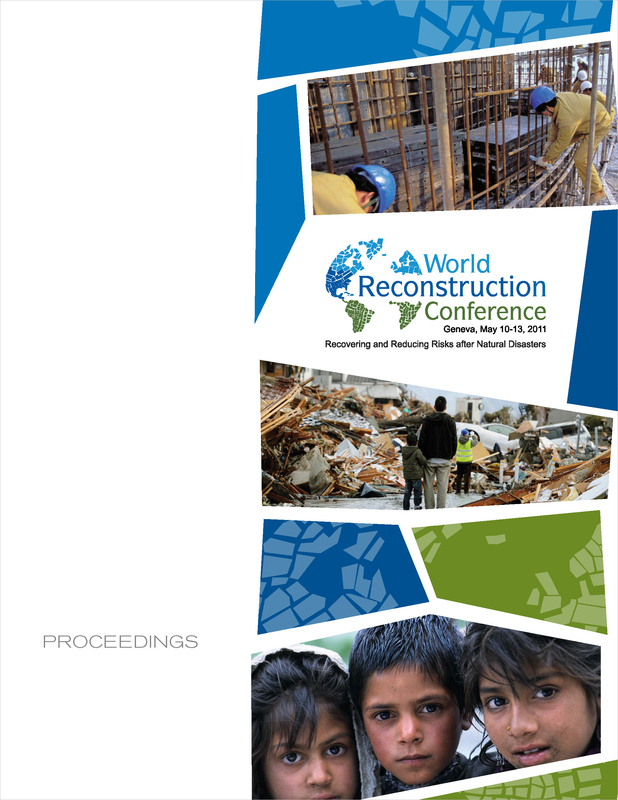 These proceedings cover the inaugural World Reconstruction Conference, which was held in Geneva in 2011. This first-of-its-kind event covered a wide variety of topics with an eye to recovering and reducing risks after natural hazard-induced disasters. Check back soon for the conference app!